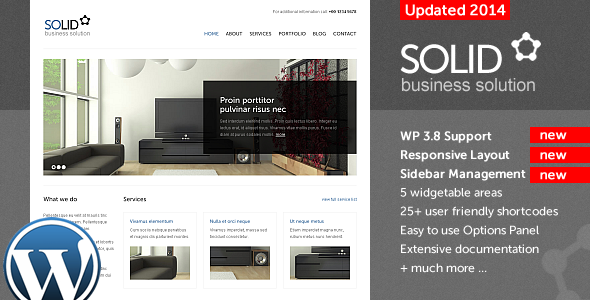 Solid is an Wordpress 3.9+ Ready Premium WordPress Theme with a clean design, suitable for any kind of corporate / business website. Version 2 is a completly new template; the classic design has been kept but the coding has been replaced in order to be brought up to date. Among the notable changes is the new responsive layout ( it works and looks great on phones and tablet as well now) and the redesigned sidebar manager and page header manager that make working with the theme even more easy and intuitive.